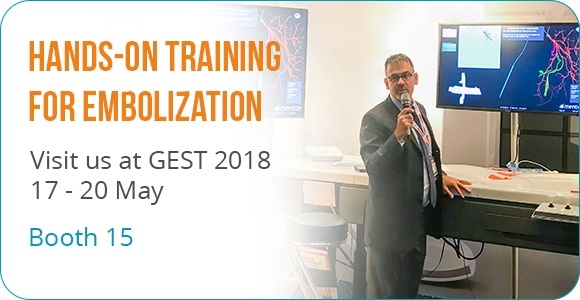 Join us at GEST 2018 at booth 15 to have hands-on experience across our suite of embolization training software. PAE is a challenging procedure with a steep learning curve—requiring advanced catheterization skills and detailed knowledge of the anatomy. Dramatically reduce the time needed to train so trainees can arrive at the cath lab with a higher level of knowledge. With fibroids affecting one in three women, UAE is a valuable, minimally invasive treatment option. In this sensitive area, training is key, to minimize radiation. This year GEST will be running CME certified PAE courses, using Mentice simulators. Led by selected expert proctors, physicians will have to ability to gain hands-on experience in treating benign prostatic hyperplasia. Acquire skills from how to identify the prostatic artery to various embolization techniques. Interested to find out more click here.